On a recent trip to the Basque region of northern Spain, Durango travelers enjoyed two very different village experiences. Turning our backs on the southern seacoast of Spain, we head inland to the Basque village of Morella nestled in a hillside, safe behind encircling stone walls. The walls are pierced by four massive gates, and we shoot through one of them in the little blue car, winding around narrow streets until we come to the Hotel Cardenal Ram. Our room looks out over the walls to terraced fields beyond - olive trees, flocks of sheep, stone farmhouses - a wispy fog over all. Great and bloody battles were fought here against the Moors of North Africa. In one of them, the legendary knight, El Cid, scaled these same walls to defeat the Moors. Dinner that night is outside at a restaurant with flickering light bulbs strung over the street. Before we can order, the doleful sound of trombones and drums rolls over us as a wavering line of candles approaches from down the street. The candles are carried by people murmuring prayers. The priest follows, waving piquant incense, and then four boys carrying a carved, sad Madonna on a wooden chair. They move down the dark street toward the Basilica de Santa Maria la Mayor, until all that is left is the merest whiff of incense. "What was that?" I ask the waiter. He shrugs and says "Pah! It is typical." But a moment later he pulls a medallion from his neck and kisses it even as he declares he is "not religious." The restaurant shakes itself as though from a dream and dinner arrives: thin slices of local cured meats, spears of white asparagus, Manchego cheese and crispy roast chicken. It is delicious. The remains of a castle are at the highest point above the village. On the walk up, we pass a 12th-century bakery with millstones strewn about, guard posts, barracks, officers' quarters, a well, a dank dungeon. At the top we lie in the sun against the castle walls, pushing aside prickly wild roses growing there. People come and go, look around, and leave. Then we leave too and go down to the Basilica de Santa Maria la Mayor with its brilliant blue dome. The basilica is awash in golden angels. On the vaulted ceiling, Gabriel blows his horn while cherubs swim through spectacular decorations. In a dark corner rests the Madonna, who was carried last night in her wooden chair. Eyes closed, she appears to be resting from that experience. At the Hotel Villa de Abalos in the La Rioja region north of Morella, we lean out of our room to gaze at the wind-smacked, fog-draped Pyrenees. unusual today," say the locals in the piazza. We can barely stand upright. Great masses of clouds and sleet descend from the mountains into the valley where we are, tearing at the lines of laundry strung up on the rooftops, chasing everyone inside. At the Convent de Santa Maria de la Piscina, we find a footpath to a hill from which we can see the ruins of the convent, and then climb down toward it past wild lavender blowing in the gentle, now tamed, wind. We twist through rows of purple grapes dangling from vines (a few make their way into our mouths) before reaching la Piscina. In a rocky escarpment next to the ruins, burial vaults for long-departed nuns are carved into the speckled rocks. Each is human-shaped. The murmuring of bees there makes us sleepy. I lie on the front step and feel the sun's warmth rising from the marble below, my head against the thick wooden door, which used to be bright blue but is faded now with the passing of more than 900 years. The breeze blowing through la Piscina still carries the faint, waxy smells of beeswax candles. Sunlight catches the shiny path of a snail which has crossed over the Madonna carved over the doorway, and all is peaceful. 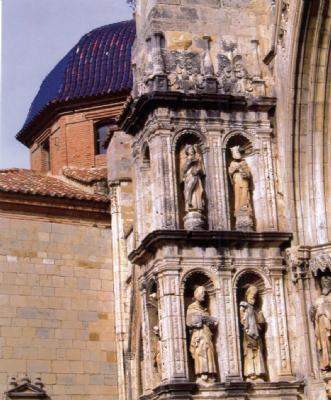 - Hotel Cardenal Ram, Morella, Spain: info@cardenalram.com; 75 euros/night in a large, beautiful room with view. - Hotel Villa de Abalos, Abalos, Spain: hotel@hotelvilladeabalos.com, 105 euros/night, including spectacular full breakfast. - Manchego cheese, a speciality of Spain, can be bought locally at Guido’s Favorite Foods, at $21.99/ pound.